This table lamp is assembled from fairly simple brass parts. Four curved stems supporting a dished conical shade are riveted through balls on to a scalloped base. The stems are held together by three rings. A lamp holder is fixed to the highest ring. 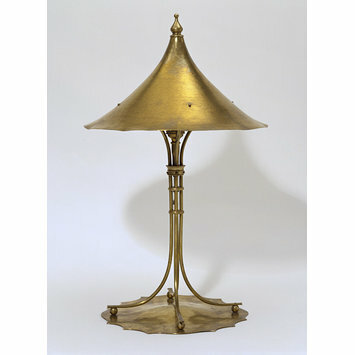 This brass lamp was probably designed by Arthur Dixon (1856-1929) and was made by the Birmingham Guild of Handicraft, founded by Dixon in 1890. The plain design and simple construction of this lamp must have seemed 'naked' to most Victorian eyes, but endearingly 'honest' and clear to a fellow Arts and Crafts designer such as C.R. Ashbee (1863-1942). He received the lamp as a wedding present from Dixon in 1895. The first Arts and Crafts metalwork made in Birmingham was produced by the Birmingham Guild of Handicraft. The Guild began by making chased and embossed door furniture. It exhibited at the Arts and Crafts Exhibition Society in 1893. The Guild's finger-plates (pieces of metal fastened to doors to prevent finger marks from spoiling the paint work), lockplates and hinges were generally made from flat pieces of brass, copper and gun metal, cut into crisp ogee (S-shaped) outlines and other designs based on 15th- and 16th-century vernacular door furniture. The Guild's traditionalism and reliance on simple outlines in its designs was guided by the austere hand of Arthur Dixon.